It ended up being a crazy week of pasta for me. We stopped by Tony and Joe’s for lunch during the week. You wouldn’t know it from the outside, but it’s not just a pick-up joint here… they actually have an adorable little dining area inside. T went with the eggplant parm. Biggest plate of eggplant parm I’ve ever witnessed in my life. HA! 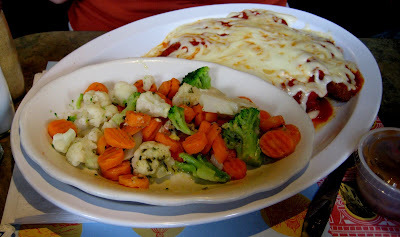 Those veggies aren’t just plain… they were loaded with garlicky and buttery goodness! 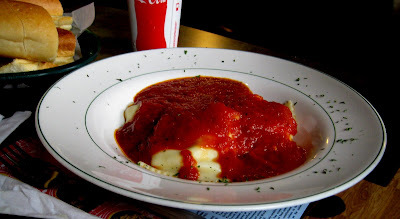 R went with her trusty old standby – ravioli. I ordered the rigatoni. The only rigatoni on the menu was rigatoni abruzzi… which was supposed to come with sausage in a spicy sauce. 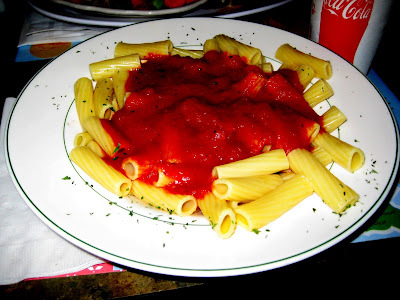 I ended up with plain old rigatoni with a red sauce. It was fine and all, but plain as all get out. I don’t know what happened… You also get garlic bread, which was pretty good. And soup or salad… we all got salad. My russian dressing was really really weird. Service was pretty good. All the pasta was made to order so it took a bit of time, but not tremendously long. It’s a nice hidden option on Conshy’s main strip. i’ve ordered their pizzas a few times and i wasn’t crazy about it. Frankly stated: greasy as hell.